This is the tangy flavor similar to lemon, orange or grapefruit. Known as the ‘high notes’ in coffee, this can be both a positive or a negative. Does the tanginess enhance the overall flavor or detract from it? Does it lend a sweetness to the flavor or is it sour? Coffee should smell like coffee. Is it a slight smell or does it smell strong? Does it smell nutty, earthy, floral, fruity, rotten, smokey, or leathery? Coffee should not be bitter. Bitterness is one of the four taste sensations (salty, sour, sweet, bitter), sharp, unpleasant, like the taste of quinine. Body is how the coffee feels in your mouth; like comparing cream to skim milk. This is how long the aftertaste lasts. Is it short and weak, or long and strong? Does it leave you ‘wanting’ for another taste right away or are you still tasting the coffee several moments after the swallow. Is it smooth or harsh? A long, smooth finish should be a few seconds and leaves you anxious for the next sip. Here you measure how all of the above harmonize with each other to create balance. Arabica: This is one of the two main species of coffee known for better flavor against its sister Robusta. It has less caffeine, and depending on the variety within the species, the bean can be very versatile in roasting profiles. 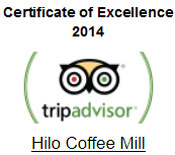 ALL Hilo Coffee Mill coffees are Arabica. Robusta: The other of the two main species, has primarily been known for its inexpensive cost. Because it is known to be higher in caffeine and inferior in the major flavor characteristics, it is often used for blending, or filler to reduce the cost of a quality coffee (Arabica). Hilo Coffee Mill does NOT sell Robusta.